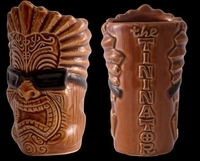 The Tininator Tiki Shot Mug; Little Brother to The Tikinator Tiki Mug. This shot mug stands 3 7/8 inches high and holds 3 oz. Designed by legendary Tiki Surf Artist Rick Rietveld. FREE SHIPPING.